A seamless integration of powerful technology and specialized support, built to help registered investment advisors (RIAs) realize their full potential. To get started, call us at 800-955-7808. As an RIA, you have a lot on your plate. E*TRADE Advisor Services provides the platform and support to help you focus on what matters most—serving your clients and growing your practice. One account, unlimited models. 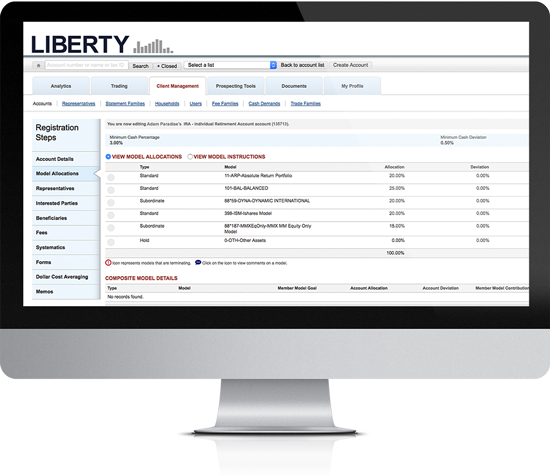 We dramatically simplify how you invest and manage your clients’ assets. Single-platform efficiency. No add-ons are needed for fee billing, performance reports, rebalancing, or account aggregation. Dedicated service and support. You get your own Relationship Manager who provides one-on-one support anytime you need it. Our advanced technology gives you a highly efficient way to trade, rebalance, and manage assets. It simplifies routine tasks, so you can be more productive in every area of your business. Built expressly for advisors. Empower your independence with easy account management tools and access anytime, anywhere. Time-saving tools. Rebalance thousands of accounts, automate back office tasks, and generate performance reports in minutes. Integrated account aggregation. Easily view and advise on your clients’ entire financial situation, including assets held elsewhere. Custom private labeling. Brand your client portals, statements, performance reports, and mobile apps with your logo. 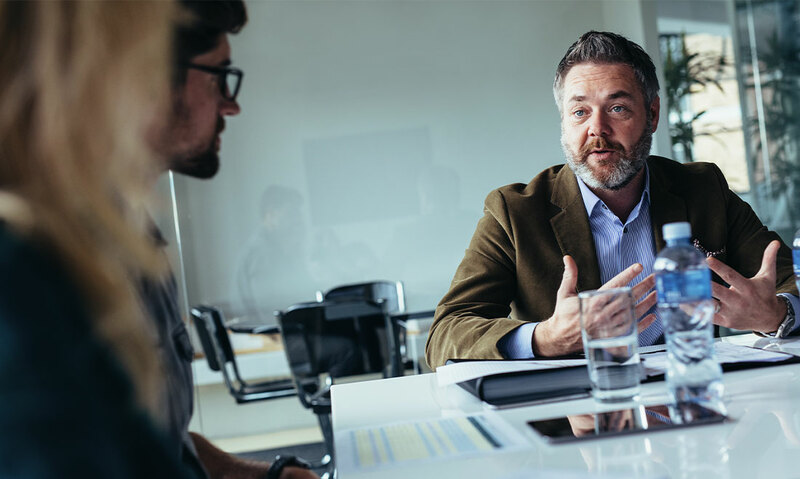 Whether you are a new RIA or have had your firm for decades, we are committed to delivering the expertise and support to help empower your success. A team that knows you. E*TRADE Advisor Services is an experienced provider who takes the time to know and understand your business. Personalized services. You don’t have to have billions in assets to get your own dedicated Relationship Manager. Single point of contact. You’ll know exactly who to call anytime you have questions or issues to troubleshoot. To get in touch, call us at 800-955-7808. Or fill out the form below and we’ll reach out to you. Please enter company. Please enter a valid company name. By entering my phone number, email address, and clicking the "Submit" button, I am expressly granting E*TRADE Financial Corporation and its affiliates permission to contact me, even if such number/email address is listed on the National Do-Not-Call Registry or E*TRADE's internal do-not-call and do-not-email lists. I acknowledge that my entering my telephone number and email address above constitutes my electronic signature for this consent. NOTE: For security reasons, please do not include sensitive information in your correspondence, such as Social Security or account numbers. © currentYear E*TRADE Savings Bank, doing business as "E*TRADE Advisor Services." Member FDIC. All rights reserved.